Its that time of year again to begin thinking about closing for the winter months. Try to close your pool after the water temperature drops to the low 60’s. Be sure to balance the pool water and make sure its clean as well. If you would like, you may bring in a water sample to be tested free of charge. Remove all loose parts and accessories for the pool. For example, the rope float, ladder, handrails, skimmer baskets, return fittings, toys, floats, etc. Lower the water below the skimmer if using a solid or a mesh cover. If you have a gunite pool lower the water 10″ below the tile line. Drain filter tank and blow out all plumbing lines completely. For in ground pools only, install gizmos in skimmer using an o-ring and teflon tape to seal. Blow out bottom drains and shut off valve. and put plug in pump section to keep slug of air line. Remove drain plugs from pump, filter, heater, solar panels, chemical feeders and anything else that had water in it. Remove any chlorine from the chemical feeders and dispose of properly. Turn off the power to the equipment and remove any timer pins. DE and Cartridge filters should be dissembled, hosed off, and the cartridges, grids or fingers chemically cleaned for the next summer. All pool items and equipment should be stored inside away from rodents and pests. Add winter chemicals into the water. Lay out cover and inspect it . – Make sure there is no rips, holes or tears in the cover. If so, patch or replace cover before putting it on the pool . Fill water bags about three quarters full with water. 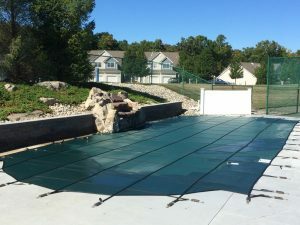 Place cover over pool, and place water bags on the perimeter to hold down cover. Raise anchors with tool in order to put the springs on the anchors. Adjust or tighten springs as needed. “Fall and Spring Maintenance: – Add Lithium Shock and half bottom of algaecide at both Thanksgiving and Easter times. This will help in keeping the water clear and algae free for the next season. 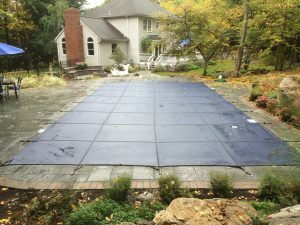 On pools with a tarp or solid cover, you must keep water and leaves off of the pool as long as possible.